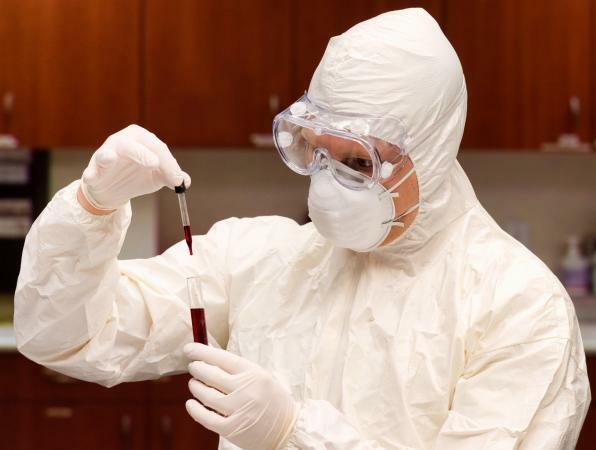 Medical protective clothing is essential equipment not only to protect medical professionals from pathogens, but also to protect patients from possible contamination by non-sterile garments. You'll find health care professionals and some patients wearing protective gear in many medical situations. Surgical caps: This headgear is worn by all staff and patients in an operating room and other surgical or dental suites to avoid contaminating the room or surgical wound with microorganisms. Surgical caps also contain the hair, similar to the need for restaurant workers to wear a hairnet or cap. They are made from light synthetic material or reusable, washable cotton. Safety goggles and face shields: Plastic safety goggles that cover the eyes and eye area are the primary eye protection from sudden back splashes and sprays of blood, other body fluids, chemicals, and other materials. Face shields that go from brow to chin can be worn over the goggles for added protection. Special-purpose safety goggles are used for providers and patients during laser surgical or cosmetic procedures. Goggles and face shields protect the eyes and face from infection or chemical or physical injuries. Masks: These are worn over the nose and mouth to prevent spreading germs to the patient from the nose and mouth in a sterile environment. Masks also protect the wearer from particulate matter or contagious organisms in the room air. They are sometimes given to patients to reduce their exposure to germs from medical workers or visitors. Masks are held snuggly on the face by fabric ties or elastic bands. 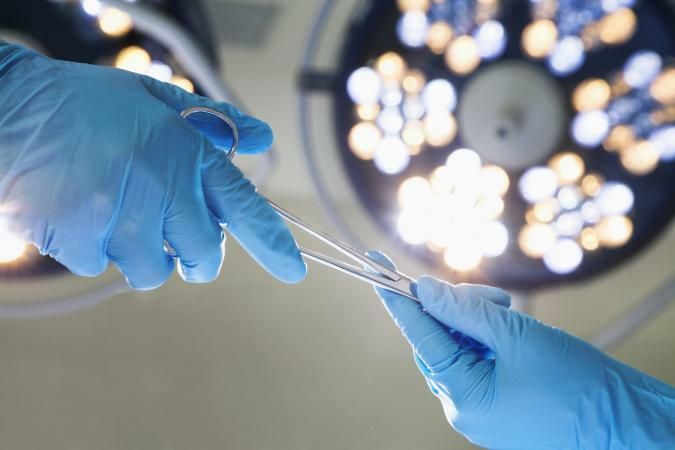 Gloves: Medical personnel wear sterile, disposable gloves when they handle any sterile surgical equipment and supplies during surgery or other procedures. This avoids contaminating equipment and patients with bacteria or other harmful organisms. Gloves also protect workers from a patient's body fluids during a procedure in the office or surgical suite, in the lab, or during blood drawing. Latex gloves are the most common type used, but persons with latex allergies can use other materials. Scrubs: These are some of the most familiar medical garments. 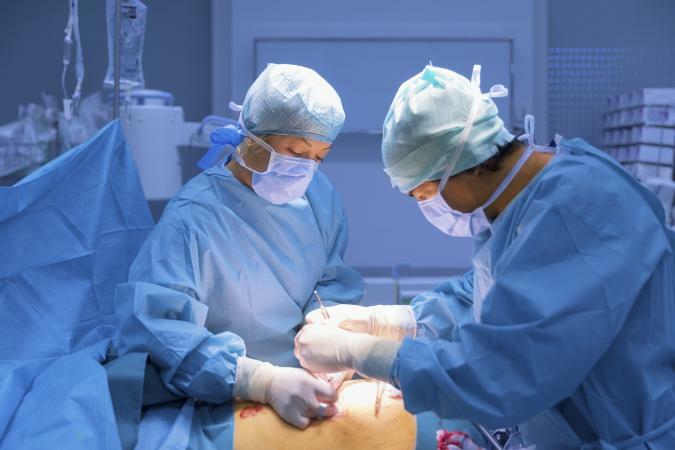 They are required in the operating room and other settings where exposure to contaminants is possible, and they reduce tracking harmful agents into a surgical suite. They are reusable and are practical for saving personnel's own clothes from being soiled or contaminated. Scrubs are generally made of comfortable cotton and are easy to change or replace. They are widely available in a variety of solid colors and prints with matching pants and tops or dresses. Surgical gowns: Surgeons and others at the operating table are required to wear these rear-closure gowns in the operating room. 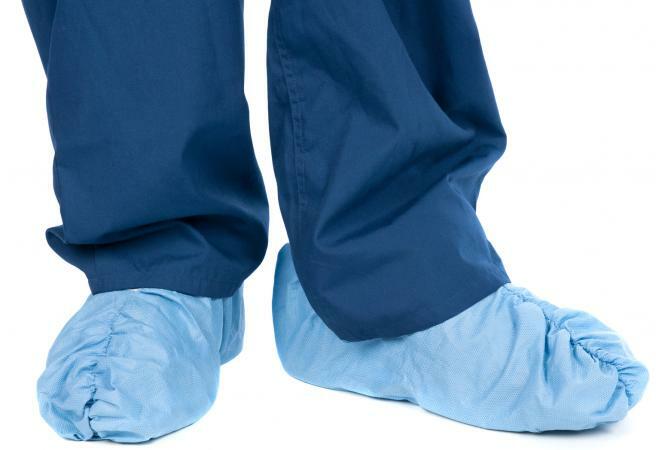 They are worn over scrubs and help maintain a sterile surgical field essential for protecting the patient from infection. Gowns are long-sleeved with elastic cuffs at the wrists and generally reach the calves, knees, or just below, depending on the user's height. Modern gowns are made of synthetic material and are immediately discarded after a procedure. Surgical sleeves: These are additional disposable shields for the lower arms that go from wrists to elbows. They are added during major surgery when extra protection from blood or other fluids is needed above the gloves. Surgical sleeves have elastic at both the wrists and top for a secure fit over the long sleeves of the surgical gown. Coveralls or jumpsuits: These one-piece garments cover an individual from head-to-toe and include attached booties. They generally fasten in the front and may include a hood or attached mask. Coveralls are made of lightweight, disposable material and are worn by medical personnel when additional protection is needed. Shoe covers: These water-proof booties cover a user's footwear completely. Their purpose is to limit the tracking of microorganisms and other hazards from in and out of the operating suite or procedure room. Like other medical protective covering, shoe covers are made of lightweight material and are disposable. Lab coats: This recognizable white coat is part of the uniform and traditions of doctors, other healthcare personnel, and scientists. Lab coats are somewhat protective of users' clothing in the office but are not useful to maintain a sterile environment. They do have convenient pockets, which are handy for carting around small supplies. These reusable, durable coats are either made of cotton or a cotton/polyester mix. Who Wears Medical Protective Attire? Visitors to hospital units or rooms where infection might be a threat to patients' health, such as adult and neonatal intensive care units, or isolation rooms. Visitors might be required to wear an isolation gown, a mask, and gloves in these areas and discard them before they leave. Medical personal protection clothing and equipment are part of the standard regulations of the Occupational Safety and Health Administration (OSHA) for standard precautions in the workplace to ensure protection and safety for everyone. The right safety garments also help promote universal precautions for health and safety in all necessary settings. The Federal Drug Administration (FDA) sets the standards for the quality and performance of medical protective clothing and devices. Employers of medical personnel are required by OSHA to provide the majority of the standard protective clothing and supplies outlined above. They might also supply surgical scrubs and lab coats, or the employees might have to buy these themselves. Scrubs and Beyond: You can choose from a variety of brands for lab coats and jackets, scrub pants and tops, shoes, and other medical supplies. Prices for clothing range from $10 to around $50 depending on what you want. You can shop in stores or online. They ship anywhere in the United States except for Alaska and Hawaii. Shipping costs depend on location. Quick Medical: This online store offers a wide range of caps, masks, gloves, shoe covers, and disposable gowns and jackets in bulk. Prices start at around $3 for a bag of 100 caps to around $800 for a case of 50 coveralls. Shipping costs depend on amount of purchase and locations in the United States. Net32.com: You can buy low-cost disposable gowns, gloves, and masks for dental practices online. Shipping costs are calculated at checkout. Alibaba.com: This company supplies a variety of bulk medical disposable clothing including surgical gowns, caps, masks, and gloves. Medline: This is a national company that sells medical clothing and many other supplies in bulk to hospitals, doctors offices, and other medical services. Wearing protective clothing in medical settings and other situations shields healthcare and other professionals and the people they care for from infection and other harmful agents. This is an important aspect of standard prevention and safety recommendations that protect everyone from injury or illness.